Unblock-Us Review - Is This Really a 'Smart VPN' Service? The world is dominated by digital technology; if you’re reading this, the chances are you own a smart phone, possibly a tablet, and likely have some sort of home computer. You will almost certainly use a computer in the workplace, and it’s a fair bet that you will indulge in social networking in your leisure time. 2 How Does Unblock-Us Work? 3 What Can I Use it For? 4 Is it Easy to Set up? Unblock-Us is one of a growing number of Smart VPN services that offer excellent levels of anonymity. Basically, a virtual private network is a service intended to help you protect your identity and information when online, and also to offer you the added benefit of being able to access information that may be restricted thanks to geographical or copyright reasons. A Smart DNS proxy such as Unblock-Us takes things a little further, so let’s have closer look in more detail about why it may be a better choice than a standard VPN. The concept of a VPN has been with us for some years, but only recently have we seen them develop into DNS-based services as powerful and adaptable as Unblock-Us. It calls itself a ‘smart VPN’, and we agree that it is very smart indeed. So, why do you need a Smart DNS service, how will it benefit you, and how do you go about getting hold of, and using, Unblock-Us? All are valid questions, and you may be surprised by the answers. Whenever you send or receive information online you are utilizing one of many DNS servers; these are the machines at the very heart of the online world, and they effectively talk to each other to transfer the data we need – whether it’s looking at a Web page or sending an email. Furthermore, you have an IP address – or rather your computer does – which is a stream of numbers identifying you and your location. It’s here that the problems begin, and also where Unblock-Us starts to appeal. If you travel a lot you will know that in some countries there are restrictions on what can and cannot be accessed on the Internet. Take China, for example, where the legendary Great Firewall has been virtually erected to keep those in the country from visiting chat rooms and viewing content considered to be subversive or unsuitable. China is not alone in this respect; other countries that censor Internet usage include Saudi Arabia and other countries like Syria, Indonesia and many more. Anyone visiting these countries may find that they are unable to stream their favorite TV programs or movies, or access content through Google. This is because the server they make the request through will know where they are, and will be programmed to block certain content. Unblock-Us gets around this in a clever yet simple way; when you access content that is blocked in that country using Unblock-Us, your request is sent through a server in a different country; you have fooled the system into thinking you are not, for example, in China, but actually in the USA. It may sound complex, but once set up it’s very easy to use. Unblock-Us has many uses, but as the name suggests it is widely used for unblocking restricted content; this is a very useful tool when abroad, and also when you are in a building where content is restricted, such as your college campus or, dare we say it, place of work. The benefits are many, and you may be surprised to find that many of the most popular online TV streaming and movie channels are blocked in a number of countries. Unblock-Us can get you access to Netflix, Amazon TV, Hulu, Sky Go, BBC iPlayer, CBS, ABC and many more channels, anywhere you are in the world, and does so without any fuss. It is worth mentioning that Unblock-Us differs from most VPN services in one particular way: while a standard VPN will direct your information through that network, a Smart DNS service such as Unblock-Us uses its many servers across the world to connect you directly to the channel that you want. It’s more efficient, uses less bandwidth and is fast. You should also be aware that, while connected to this ‘Smart VPN’ your information will be encrypted, and you will remain anonymous as you are no longer identified by your IP address. This is particularly important when using your hand held tablet, smart phone or laptop in a public WiFi spot, where the connection is far from secure. 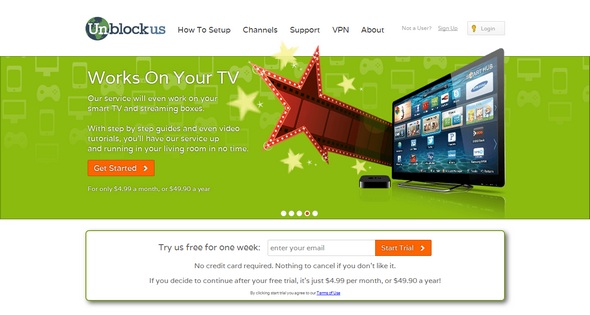 We found Unblock-Us very simple to install and use: you simply go to the website – www.Unblock-Us.com – and follow the instructions. You have two options: you can set up your home router in a few short steps, with full instructions on the screen, and this will allow you to use the service on any devices that you use in the home, or you can set up a selected individual device. Unblock-Us works with tablets, smart phones, games consoles and smart TVs, and can be used with Windows, iPhones and iPads, on Amazon devices and on Android equipped devices, each of which is selected by a simple click on the relevant screen, with full instructions to follow. Changing your router settings, as it does, may sound scary, but in fact it does not affect any other network settings, and there will be no change to your regular browsing. In a market that is growing fast Unblock-Us is an excellent example of an essential service. Where it stands out is in being quicker than many of its rivals; this is down to the direct routing method that Unblock-Us uses, and we found it extremely efficient. Further to this, it is very simple to install and set up, and the on-screen instructions are easy to follow and sensibly written so that anyone can understand them. The only possible stumbling block for less tech-savvy users may be the option of changing router settings; if you are unsure of this it may be best to have a friend with knowledge of such things do it for you, but it is outlined simply online, so there is not too much to worry about. We like the anonymity aspect of having an identity that is not the same every time, and we also see the benefits of overcoming geo-restrictions in some countries as well as potential copyright issues: that annoying ‘not available in your country’ message on YouTube, for example, is gone forever. At a little less that $5 a month (at the time of writing) there is little on the market that comes close to Unblock-Us; it’s a fully functioning, effective and easy to use Smart DNS service that offers a range of benefits, and that may be essential for anyone who travels abroad on a regular basis.